Falling-film Evaporator - Biodiesel Solutions – Biodiesel Machinery Equipment Projects. 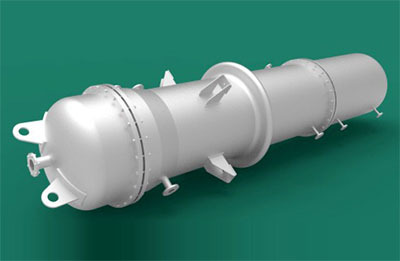 Falling-film evaporator is widely used in pharmaceutical, chemical, biological engineering, environmental engineering, waste recycling and other industries for low temperature continuous evaporation, when the liquid goes through a distributor as a film distributed to the tubes, with gravity flow lumen while being heated by steam generated outside of the tube, a light component of low boiling point reaches the top of the evaporation temperature of the steam vapor through the outlet, and the liquid phase enter into the separating chamber has reached the maximum concentration and separation purposes. 1) Feeding solution of falling-film evaporator is added from the top of the evaporator, and in the distribution of gravity fall into a film along the wall, and in this process the evaporation enriched at its bottom to obtain a concentrated solution. 2) Since the solution was made to flow in one way a film type evaporator, the heat transfer coefficient is higher. 3) The residence time is short, difficult to cause material deterioration. 4) The amount of liquid retention is small, falling film evaporator can be supplied based on needs of energy, vacuum change, feeding quantity and concentration rather take a quick operation. 5) Since the process fluid flow under gravity only, rather than temperature differential to drive, it can be used low temperature evaporation.